The flag of Vietnam is our national symbol and proud. The flag includes a large yellow 5-pointed star on red back ground. The size ratio is 2:3 (length 1½ times the height). This flag originated from 1945 when Vietnam claimed independence from French and Japanese. Since then, there’ve been several changes due to wars and territorial separation. After country re-unification in 1975, our national flag remained as it is now. If you visit Hanoi these days, you’ll have a chance to watch special flag hoisting ceremony in Ba Dinh Square, in front of the Ho Chi Minh Mausoleum. The ceremony is held at 6 am every day and attracts many locals and visitors. At 9pm, the flag lowering procedure with similar rituals take places. Watch the image of Vietnam flag flying in a video clip on Youtube. 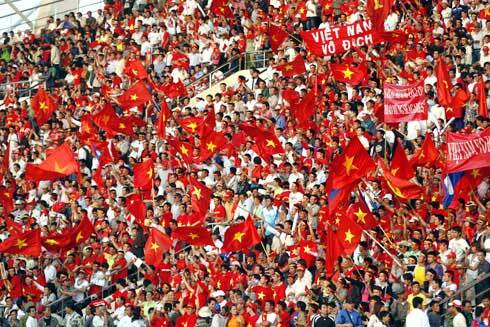 You can see impressive red color covering on stadium when Vietnam team plays in an international football (soccer) match. International Flag relating to Vietnamese Flag usage forbids the display of the flag of one nation above that of another nation. Those general regulations may be applicable for flags of other nations, I guess. There’s possibly a little different in your country. If you want to buy Vietnam’s flag or relating souvenirs, visit below page on Amazon. So, how do you think about your country flag? You must be proud of it, don’t you? Share your feeling, thoughts, or photo of your national flag here. We’d love to hear from you! Finally, if you find useful information in this article, would you mind encouraging me with a Like button? I love your thumb up. Thank you very much!